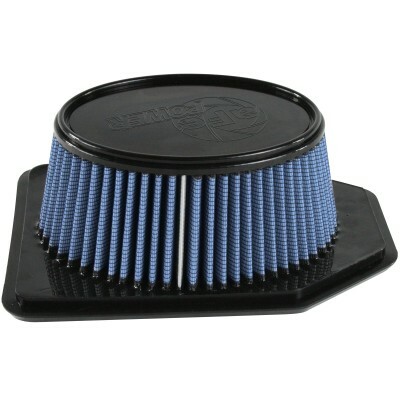 The MagnumFlow Replacement Air Filter for 2007-11 Jeep JK Wrangler V6 offers improved performance thanks to an innovative inverted filter design that maximizes surface area for improved air flow and performance that bolts right into the stock intake system. Looking for an easy, bang for your buck modification for your Jeep JK with proven performance gains? aFe has the PERFECT SOLUTION for you with the brand new release of aFe's High Performance Drop-In Filter. Replace your restrictive OE filter and increase flow by 54% over stock, there are two filter options available the Pro-5 R and the Pro-Dry S.
aFe's Pro5R filters offer the highest airflow while providing outstanding filtration. With 5 layers of progressively finer medical grade cotton gauze sandwiched between two aluminum screens. This type of media will give you least amount of air restriction and lowest possible exhaust gas temperatures (EGT's). It is ideal for vehicles that only see highway driving, or for those who want to build the most horsepower. Pro Dry S filters offers outstanding airflow, superior cumulative filter efficiency and maximum convenience. aFe's Pro Dry S OIL FREE filter media provides increased airflow at "near OE" filtration levels of 99.2%*. 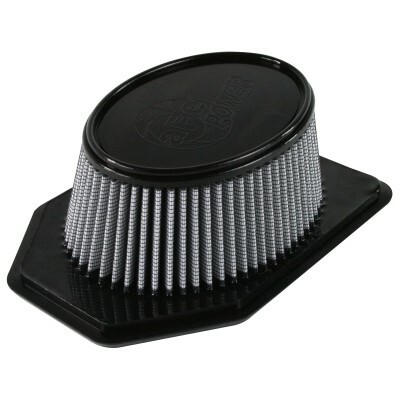 A great benefit of the Pro Dry S filter is the convenience of cleaning the filter as opposed to an oiled filter. Cleaning is as simple as washing the filter through warm water, no special chemicals or oils needed. Maintenance: Easy; Tap or wash with warm water and detergent. No chemicals and no oil.